This is a follow-up to a previous article called, “Digital Humanities: Newspaper Mentions of Four MN Governors” and this short note on John Lind serves two purposes. The first is practical, the other political. (And yes, all history is political). First, there are few easily-accessible resources discussing Lind’s politics. While I love MNopedia (hire me! ), both it and his Wikipedia page are too general. This article is not meant to be a doctoral thesis, but it is a little bulkier. Hopefully, some young scholar will be inspired to do their own research and publish the first Lind biography in nearly 80 years. Second, as Orwell said, “The most effective way to destroy people is to deny and obliterate their own understanding of their history.” Having served on a Texas textbook review panel, I’ve seen firsthand historical revisionism. I’ve seen Tea Party rhetoric creep into how we write about the past: The framing that government has always been an unnecessary evil, taxes an infringement upon liberty. Yet, when it comes to workers and women’s rights, public education, the social safety net — all the things that allow people to live with dignity — these were not gifts of the free market or God but rather the product of struggle. These came from grassroots organizing. These came from rising up against power. It came from the notion that a government of the people could be proactive and a force for good. Minnesota is full of such stories, and it’s about time we’ve heard them. A New Ulm teacher and lawyer, John Lind was first elected to the U.S. House of Representatives (MN 2nd District) in 1886, serving as a Republican until retiring in 1893. Around this time, as discontent brewed and farmers organized around a third-party alternative, Lind left the Republican Party and in 1896 supported the presidential candidacy of Democratic-Populist William Jennings Bryan. That same year he ran for governor and though a “political orphan” (Helmes 91) was endorsed by “the allied forces” of the Democratic, Populist, and Silver Republican Parties. Central to Lind’s 1898 gubernatorial campaign were conventional Populist issues such as the tax burden and railroad trusts, but so too was the Spanish-American War, which lasted from April to August of that year. The fact that Lind enlisted to serve was used to his advantage, causing the Democratic chairman to remark that “Lind fighting abroad is 10,000 votes stronger than [him] on the stump.” Becoming disillusioned with the war, as jingoism crept into his opponent’s campaign, Lind praised his allies for not permitting “the shimmer of a proposed imperial policy in distant lands to blind the eyes of the people to existing abuses at home.” On Election Day, Lind became the first candidate in a decade to win a majority of the popular vote (52.2%). President McKinley and John Lind in Minneapolis, c. 1900. From the Minnesota Historical Society. In an hour-and-a-half-long inaugural address to the legislature, Lind focused on what he saw as an antiquated tax system. Unapologetic in his defense of the services provided through taxation, he observed that the current system targeted only “visible goods” — such as tools and implements. As these were the only means of subsistence for people struggling “to support themselves … thousands who possess great wealth escape” (Lind 4-5). Though not intending to wage a war against the rich, this imbalance in the tax burden was “a condition resulting from the new forms that wealth has assumed under the remarkable progress and the economic changes which have taken place in this century” (Lind 5). He went on further to advocate an increase in a tax on corporations and the gross earnings of railroads that would make Minnesota more comparable to its “sister states” like Wisconsin and Illinois. Lind wanted to build roads and mental health hospitals, fund public schools, and support struggling farmers. These were moral ends to him as he declared proudly: “increased taxation and higher civilization go hand in hand” (Lind 6). Lind symbolized transition in viewpoint as the state stood on the threshold of the new century. … Significant beginnings had been made in frontier days; social needs of modern character had been foreshadowed; and some forward steps had been taken. …. [Lind and his successors] realized that they were dealing with a state shifting from an agricultural to an industrialized stage (434). “He is the only man who has stood on the threshold of the governor’s office of this state, like Horatius on the bridge, with the people on one side and the greedy corporations on the other, and protected with all his strength the people from the corporations’ greed” (Helmes 104). John Lind, American Mediator in Mexico City. 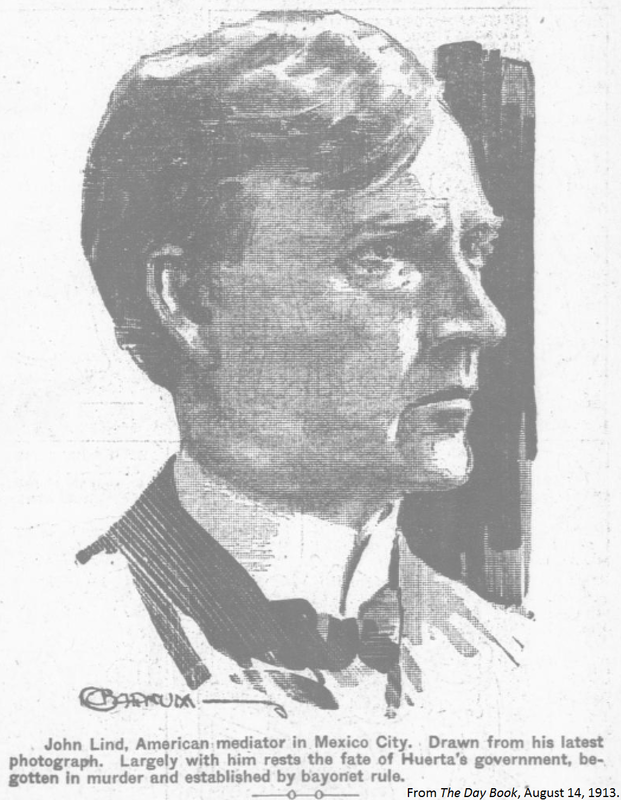 From The Day Book, August 14, 1913. Thereafter, Lind returned to law practice and, two years later, was reelected to the U.S. House of Representatives (5th District), serving from 1903 to 1905. 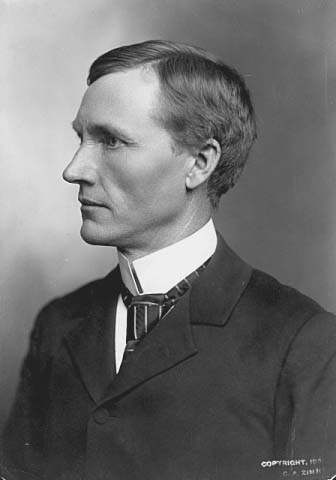 In 1908 he again campaigned for Bryan and was appointed by Governor Johnson to the University of Minnesota’s board of regents where he served as chairman until 1914. His last stint in government grew from his longstanding relationship to Bryan who, by 1913, was President Wilson’s Secretary of State. As the Mexican Revolution roared on the nation’s southern border, following a recent military coup, Lind was appointed an emissary to Mexico. Tasked with delivering treaty terms to Victoriano Huerta, Mexico’s new president, it was obvious President Wilson “was concerned more with general competence and trustworthiness than with special qualifications” as Lind neither spoke Spanish nor understood the politics of the country (Cumberland 97). Sadly, given both Wilson’s disdain for Huerta and the country’s volatility, the “mission was doomed to failure before he ever arrived in Mexico” (Cumberland 97). When the United States entered World War One in 1917, which led to the resignation of Secretary Bryan but Lind reluctantly supported, Minnesota created the state Public Safety Commission. Tasked with aiding the war effort, the commission investigated German-language textbooks, registered aliens, and targeted pacifistic dissent (Gilman 58). Appointed by the governor, Lind was a moderate who worked “relentlessly for the suppression of the [Industrial Workers of the World]” (Chrislock 77). Soon afterward, as the commission became increasingly aggressive in its work, Lind resigned in protest. He remained in Minneapolis until his death in 1930. Blegen, Theodore C. Minnesota: A History of the State (Minneapolis: University of Minnesota Press, 1975). Chrislock, Carl H. Watchdog of Loyalty: The Minnesota Public Safety Commission During World War I. (St. Paul: Minnesota Historical Society Press, 1991). Cumberland, Charles C. Mexican Revolution: The Constitutionalist Years. (Austin: University of Texas Press, 1972). Gilman, Rhoda R. Stand Up! The Story of Minnesota’s Protest Tradition (St. Paul: Minnesota Historical Society Press, 2012). Helmes, Winifred G. John A. Johnson: The People’s Governor (Minneapolis: University of Minnesota Press, 1949). Lind, John. Biennial Messages of Governors to the Legislature of Minnesota, 1899. (St. Paul: The Pioneer Press Company, 1899). Minnesota Historical Society. An Inventory of John Lind’s Papers. Stephenson, George M. John Lind of Minnesota. (Minneapolis: University of Minnesota Press, 1935).